Late last week, the investigators of the large international MINDACT (Microarray in Node Negative and 1-3 Positive Lymph Node Disease May Avoid Chemotherapy) Trial, published in the New England Journal of Medicine, proved that potentially 46% of women with clinically high risk oestrogen positive HER2 negative early breast cancer with up to three lymph nodes involved, may receive no benefit from chemotherapy if they return a low risk 70 gene signature (MammaPrint) genomic result. Dr Hingston is now calling on all medical oncologists to consider using MammaPrint due to the publication of the Level 1A data late last week confirming that the envisaged benefit of chemotherapy in a selected subgroup of Australian women with breast cancer may not actually be present. MammaPrint testing could potentially benefit around 2,000 Australian women each year, preventing them needlessly suffering the risks of chemotherapy – namely long term cardiotoxicity, secondary leukemia, impairment in cognitive function and neurotoxicity. Further, he is renewing his call to the Australian Government Department of Health Medical Services Advisory Committee, asking that MammaPrint be funded in full by the Government. “MINDACT has now clearly shown that MammaPrint is both prognostic and predictive, and Australian women should join women from all over the world who are now benefitting from this new genomic microarray technology. Approximately 2,000 Australian women each year could benefit from MammaPrint testing, and they should not undergo the harms of chemotherapy if there is no significant benefit to this treatment, just because they can not afford this new test”. The price of MammaPrint has been stable at $USD4,200 for the last several years. Dr Hingston introduced fixed formalin paraffin embedded (FFPE) MammaPrint testing into Australia in late 2013, and he has personally seen the benefits of this genomic test on many of his own patients. A small part of the breast cancer (either one core of the preoperative core biopsy or a small piece of the surgically resected tumour) is sent overseas to the MammaPrint laboratory located in Los Angeles for testing. There is a 12 – 14 day turn around, and the result is returned as either low risk or high risk. Testing is ordered online by medical or surgical oncologists looking after women with a new diagnosis of early breast cancer. The 70 gene signature MammaPrint microarray test was initially developed in Holland by Dr Laura Van’t Veer on a sample group of 100 women who had breast cancer. She first published her findings in Nature back in 2002. Since then, MammaPrint testing has been approved by the FDA, and has now been proven in many large retrospective studies. However, MammaPrint is now the first genomic test to provide Level 1A prospective randomized data from a large Phase 3 trial of women with an early diagnosis of breast cancer who have been followed for five years. MINDACT tested MammaPrint on 6,693 women from 111 medical centres from 9 European countries. 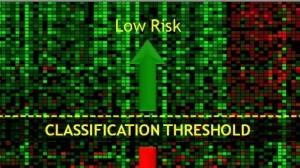 No other genomic test has yet provided Level 1A prospective randomized data to support its use in clinical practice. The MINDACT results have shown that out of 1,550 women who were allocated to the high clinical risk:low genomic risk subgroup, that the rate of survival without distant metastasis was 94.7% (95% confidence interval, 92.5 to 96.2) among those not receiving chemotherapy. The authors of MINDACT therefore conclude that “Given these findings, approximately 46% of women with breast cancer who are at high clinical risk might not require chemotherapy” if they return a low genomic risk MammaPrint result. MINDACT has now confirmed beyond any reasonable doubt that MammaPrint genomic testing represents a new paradigm shift in modern breast cancer management. Dr Bernard Fisher published back in 2002 the National Surgical Adjuvant Breast and Bowel Project (NSABP) 25 year follow up data confirming that partial mastectomy and radiotherapy had the same long term survival rates as mastectomy. This was the first major paradigm shift in modern breast cancer management, and sentinel node biopsy has now been accepted as being the second significant paradigm shift, replacing axillary clearance in the majority of women with breast cancer. Dr Hingston now states that MammaPrint testing, as shown by the Level 1A prospective randomized MINDACT data, is being recognized as being the next significant paradigm shift in modern breast cancer management, and clinicians the world over are now embracing this MammaPrint technology on behalf of their patients. 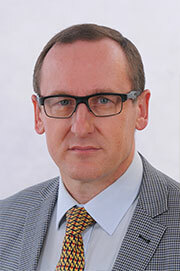 Dr Guy Hingston is a surgical oncologist with nearly 20 years experience in the oncoplastic management of women with breast cancer. He resides in Port Macquarie providing comprehensive breast cancer surgical service in a private capacity to women from northern New South Wales. He is currently setting up a breast cancer genomic study through the University of Newcastle’s Hunter Medical Research Institute, using next generation sequencing and droplet digital polymerase chain reaction equipment to individually characterise mutations in breast cancer, and he is hoping to shortly commence measurement of circulating tumour DNA in women with breast cancer. He is a new breed of oncoplastic breast cancer surgeon who believes that modern genomic assessment (like MammaPrint) is now part of the future management of all women who develop breast cancer. He is also currently the surgical oncology representative on the TransTasman Radiation Oncology Group Scientific Trials Independent Data Safety & Monitoring Committee.